It’s 31 March 2017. At 05:51, train 2H81 departs, one minute late, from Platform 6 at Carlisle. Nothing remarkable in that, you might think, and anyway, what’s a minute between friends? This, though, was a Northern service to Leeds, travelling via the Settle and Carlisle route. Anyone turning up at Platform 6 to catch this train on 10 February 2016 would have experienced a far longer wait – more than thirteen months in fact. It was either that, or take the bus. The departure of 2H81 marked a triumph for Network Rail and its engineering contractors. A visit by 60103 ‘Flying Scotsman’ later that day provided the crowning glory. Extensive works to repair a massive landslip that had closed the railway, as a through route, had been completed on time and on budget. Indeed, the line had been handed back on 22 March, nine days prior to the commencement of the new Northern timetable. It was business as usual on the Settle and Carlisle line and everyone was celebrating yet, in February 2016, the naysayers had been predicting that the route was doomed. As has been extensively reported, services on the Settle and Carlisle line were disrupted during the winter of 2015-16 by flooding and a serious landslip near Armathwaite. Flooding due to Storm Desmond had caused the line to be closed for several days at the beginning of December. From 29 January, the landslip at Eden Brows, north of Armathwaite, caused the southbound line to be closed between Howe & Co’s sidings and Culgaith. This was to allow the line to be inspected and emergency stabilisation works to be undertaken. Problems at this location had first been reported in mid December, but repairs were undertaken and services resumed on 22 December. Further movement of the embankment resulted in the complete closure of the line at that point from 9 February. The foot of the embankment had been washed away by the River Eden and the saturated fill supporting the formation was descending towards the river. It was estimated that upwards of 500,000 tonnes of earth was on the move – about 100 times the tonnage that had fallen into the sea at Dawlish two years previously. So what could be done? The answer was – not a lot in the first instance. With the embankment still in an unstable condition, work on site was severely restricted. Aerial surveys using drones showed that, over a distance of 200 metres, the railway formation had dropped by 1.5 metres due to a rotational slump and was still moving. The line at this point passes along a built up ledge some 60 metres above the river Eden. Erosion to the toe of the embankment had destabilised the entire hillside. Various design solutions were proposed, including single lining, diverting the railway, constructing a bridge, pinning the embankment in place, or even digging out the entire embankment and filling it with solid material. All of these were discounted. Network Rail appointed Story Contracting to undertake an extensive assessment. Aerial surveying, movement measurement and ground investigation works were undertaken in order to build up an understanding of the slope slippage and its cause. Only then could an effective and permanent design solution to be established. Story Contracting employed AECOM to undertake design work, with Network Rail using Coffey to provide third part approval (category III checking), independently interpret the data and provide design verification. A contiguous piling solution was chosen as the preferred option, in which two rows of closely spaced piles to the bedrock would support a concrete slab upon which the railway would be laid. In effect, this would be a buried viaduct, capable of supporting the railway in safety even if the hillside were to subsequently move again. The construction contract was awarded to Story Contracting, along with a concurrent second phase to stabilise the embankment, install extensive new drainage and rock armour to prevent further erosion. The total Settle-Carlisle project costs were £23 million and £4.5 million respectively, of which the Story Contracting contribution was valued at £15 million. Because of known fault lines passing through the site at right angles to the railway, several 30-metre-deep bore holes had been sunk in order to understand fully the geological situation. Throughout the project, ground movements were carefully monitored using a combination of aerial surveys and continuous laser positional measurement of fixed marker points. Finalised on July 2016, the chosen design solution required the insertion of 226 piles on 750mm centres, forming two contiguous rows. They were to be sunk to a depth of 20 metres under the Up line and 18 metres under the Down line, with 4-5 metres being within the bedrock. Van Elle was appointed to undertake this work using an air drilling technique. The piles themselves were mainly 660mm in diameter, formed of reinforced concrete protected by specially manufactured steel outer casings. The reinforcement consisted of seven B40 bars with 16mm shear bracing. In all, 4,040 metres of piling was sunk using two rigs. A third piling rig was kept on site as a standby unit, but it was never needed. The design solution called for a one-metre-thick reinforced concrete slab, incorporating a ballast retention wall, three metres high, to be cast on top of the piles. This meant that the piling work needed to be undertaken four metres below rail level, necessitating the removal of 9,000 tonnes of spoil. For environmental as well as practical reasons, all of the spoil was transported away from the work site by train. The work progressed well, helped in no small measure by an untypically dry Cumbrian winter – a complete reversal of the year before! By the beginning of February 2017, all the piling work was complete and a start could be made on constructing the reinforced concrete slab. Together with the integral retaining wall, the volume of concrete needed was 1,218 cubic metres. The slab is 12.5 metres wide and 75 metres long, but has been formed in five sections. Its three-metre-high retaining wall, longer at 95 metres, was cast in seven sections. New drainage to manage surface water was also installed. With the slab in place and with the waterproofing membrane laid, it was time to make up the new track formation. About 6,000 tonnes of aggregate backfill was required, transported to site by train. Upon this the track was laid, requiring a further 3,000 tonnes of track ballast. The track itself has been slewed 400mm, requiring a realignment of 2.4km of track. This phase of the project was completed two days ahead of schedule; with the first tamp occurring on 22 March. A Network Rail track recording train traversed the route the next day, followed by Northern Rail route familiarisation runs, leading up to the commencement of the new passenger timetable on 31 March. Slope and scour works forming Phase 2 of the project, again undertaken by Story Contracting, will continue until the end of 2017. Directional drilling is being undertaken to install a new drainage scheme that, together with a series of ditches, will remove water from the embankment and thereby improve its stability. The embankment is being graded and then faced with rock fill. Substantial rock armour will prevent the river eroding the embankment toe. Tree planting will follow in order to stabilise the land. By any standards, the repairs undertaken at Eden Brows were exceptional – Network Rail classified the project as the most difficult repair job they have ever undertaken. Throughout the history of the Settle and Carlisle line, the formation at Eden Brows has given trouble. This has been blamed on the built up nature of the ledge that supports the railway. During the excavation works prior to piling, the stratified manner in which imported material had been compacted could be clearly seen – a technique that would not find favour today. Perhaps the slippage at Eden Brows was inevitable. It’s sobering to think that, if this has happened during the 1980s, in would almost certainly have been curtains for this classic railway. It is greatly to Network Rail’s credit that a permanent repair was always its objective. Network Rail has also been praiseworthy in taking advantage of the temporary closure to bring forward planned works. In this way, future disruption on the route has been minimised. The work has included drainage schemes, viaduct waterproofing and embankment/cutting stabilisation. There are just two manned level crossings on the Settle and Carlisle railway, located at Culgaith and Low House Crossing. Both are MCB (Manually Controlled Barrier) crossings, controlled from adjacent signal boxes. The existing hydraulic lifting barriers had been installed in the mid-1970s. At both level crossings just two full-width barriers were provided and they were not trouble free. In projects undertaken by Babcock Rail, they have been replaced by four-barrier SPX systems. The barrier control systems were also entirely renewed and LED wig-wag signals have been provided, together with replacement fencing and anti-trespass guards. Concurrently with the Eden Brows repair project, Story Contracting also undertook an extensive drainage and watercourse containment scheme near Dent (issue 145, November 2016). It was novel in that the designers, AECOM, used building block modelling in the design phase, literally making use of model building blocks – Lego® to you and me! By making use of Legato™ interlocking concrete blocks, the design was easily scaled up. Although they weigh up to two tonnes each these blocks are dimensionally similar in proportion to the famous plastic toy building blocks. The resultant construction was a complex stepped weir and water channel, designed to divert and slow down the flow of Cowgill Beck, which had been causing erosion and instability within the toe of the adjacent railway embankment. Because of the remote site location and severe access difficulties, this novel use of pre-cast interlocking blocks created a structure that is self-supporting and which could be easily transported to site and assembled without the use of wet concrete. Story Contracting was also busy at Little Salkeld, where one of the 17 viaducts of the Settle and Carlisle line needed remedial works. This seven-span brick and masonry structure had defects resulting from a failed or non-existent waterproofing system. In addition, the internal faces of the parapets were below a minimum safe height for maintenance staff and there was extensive vegetation growth throughout. The spandrel walls were showing some signs of movement from plumb, with longitudinal cracks on the edge of the barrel indicating that separation had occurred on all the spans, mainly on the outside of the curve. The remit from Network Rail to strengthen and waterproof the viaduct required the use of L-shaped concrete slab units, together with waterproofing and new drainage. The precast concrete slab system, supplied by Moore Concrete of Ballymena, Co Antrim, is similar to that installed on Twemlow viaduct in Cheshire, as reported in the April 2016 edition of Rail Engineer (issue 138). A total of 136 concrete sections form a structural over-slab, tied into the spandrels and united along the centre line of the viaduct by means of an in situ concrete stitch. The result is a waterproof channel that also provides ballast retention. Lateral forces within the ballast are restrained by the reinforced concrete channel, rather than by the parapets and spandrel walls. Additional works at Little Salkeld included the pinning of the copings with stainless steel dowels as well as the installation of handrails and downpipes. This 12-week project was valued at £1.3 million. Further along the line towards Carlisle, Story Contracting was also engaged to undertake cutting stabilisation works at Folly Brow. Located near Dry Beck viaduct just north of Armathwaite, this quarter-mile-long cutting has a predominance of near vertical sandstone rock faces. Several large plane failures were present and areas of ravelling. The condition of the slope had deteriorating due to ingress of roots from the vegetation present. This three-month £600,000 scheme involved scaling of the cutting and the installation of 126 rock dowels and 2,150 square metres rock fall netting. By utilising the existing blockade for the Eden Brows works the timescale and cost were significantly reduced compared to using normal rules of the route (ROR) possessions. Emergency works weren’t restricted to the Eden Brows site. J Murphy & Sons was engaged to deal with two further embankment slip problems – one just south of Armathwaite station and the other at nearby Baron Wood. Problems had arisen at Armathwaite in December 2015, even before the Eden Brows slip had truly manifested itself. A speed restriction was imposed on the Up line due to a slip at the embankment toe, caused by a failed culvert. Murphy was called upon to effect emergency repairs, involving the installation of H-piles into a temporary embankment repair. Approximately 1,200 tonnes of 6G stone was then brought in to create a haul road in anticipation of a permanent repair scheme. Murphy received the go-ahead for permanent repairs in December 2016. A king post wall was installed to support an embankment re-grade and about 370 cubic metres of concrete was used to infill the redundant culvert. Improved drainage through the embankment made use of 600mm HDPE piping. In all, about 5,800 tonnes of stone was used throughout the scheme on both sides of the structure. These works were completed in March 2017, two weeks ahead of schedule. Murphy was notified of similar problems at Baron Wood in January 2016. A team was mobilised immediately and a 24-hour monitoring watch was placed on the site. Once the design solution was approved, multiple machines were imported, including a 30-tonne excavator, road-rail vehicle and a spider excavator. Re-grade works involved stone installation together with soil nails to assist in strengthening the embankment. Maccaferri netting provided further stability to the re-graded embankment. When train 2H81 left Carlisle on 31 March and Northern resumed a normal daily timetable, it didn’t come at all too soon. Although the line remained open, initially northwards as far as Appleby and later to Armathwaite, it was estimated that passenger numbers had fallen by 60-70 per cent. It seems that rail users just don’t like using buses! The route is popular with tourists and commuters alike and passenger figures had been averaging 1.2 million per year. The important work now will be in rebuilding that figure. Friends of the Settle Carlisle Line chairman Douglas Hodgins summed things up very well. He said: “We have been working closely with Network Rail and Northern over the past months to get the best of outcomes to what could have been a catastrophic event for the line’s present and future. The enormity of the repair task cannot be overstated. We are very grateful that such effort has been put into getting us to this stage and we are all working hard to ensure that the line – built as a main line between London and Scotland – can resume its role as a vital part of the UK’s rail network as soon as possible. The people at the sharp end, Story Contracting in particular, didn’t do a bad job either! 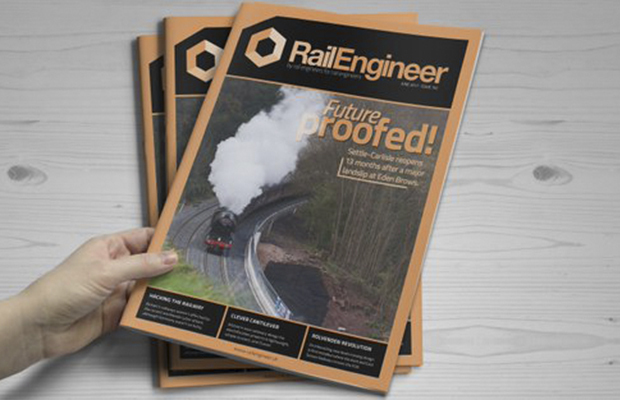 This article was written by Stuart Marsh for Rail Engineer June issue.